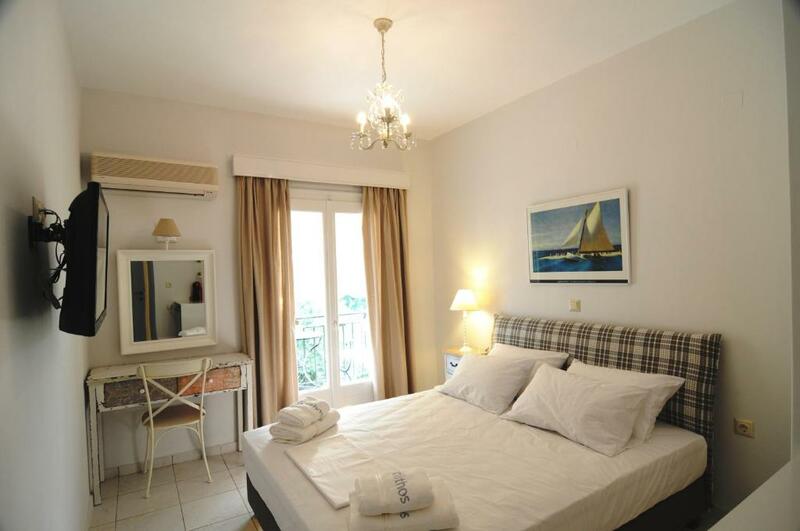 Lock in a great price for Arolithos – rated 9.5 by recent guests! The proprietor, Eugenia, is an absolute delight. She made us feel so welcome. Her property is immaculately run, the rooms are very comfortable, the breakfasts served in the rooms are delicious (more than one can eat), and the location is great (the sea, restaurants, and local shops are right at the end of the street, and it's just a few minutes walk along the shoreline to the center of town). We couldn't have been happier with this choice and hope to stay there again. 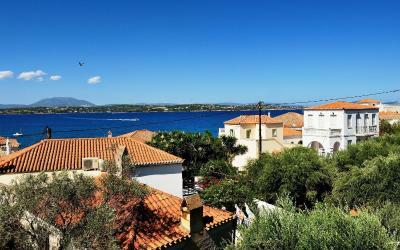 Spetses is a beautiful destination in its own right, but staying somewhere so welcoming and comfortable made it particularly memorable. Highly recommended. We felt welcomed from the moment we walked into the door. Very quiet as well as perfectly comfortable. The suite is immaculate from the bedding to the paint on the walls! Wonderful Greek pasteries from the bakery on the corner. A must....! The owner, Sylvia I think, was very friendly and helpful and made us feel welcome and enjoy our stay. The beds were very comfortable and the bathrooms modern and well equipped - lovely showers. The property has a very sunny and relaxing roof terrace where we had breakfast each morning, a lovely way to start the day. The lady proprietor spoke very good English and was very helpfull. The breakfasts were delivered to the room and were more than generous!She supplied us with towel for the beach. we were delighted with our hotel. -Location is great, most of the Island is hilly and difficult to traverse, but Arolithos is right on the beach, and the walk to the center is in completely flat terrain and right next to the sea. Bus stop for some of the beaches is about 15 meters away and even some restaurants and bars only a few minutes walking distance! - Room and bathroom were clean and spotless. Towels and sheets always changed on time. - Both the personel that handled the breakfast and cleaning were kind and always helpfull. - Owner was welcoming and personal, and always tryign to give the best service. -Amenities for price were excellent, cookies and snacks offered and renewed everyday, breakfast was complete and varied. All in all a superb experience. I had a fabulous girlie break . We had two rooms and we were delivered an abundant breakfast at a time we requested every morning which we took to a communal roof terrace. The terrace had fabulous views over the sea and hills. We also used this terrace in the evenings and late nights to socialise. The staff were very friendly with a lovely sense of fun and extremely attentive to ensuring we had fun on our holidays. Would go back and take my family too. The sea is a stones throw from the front door so we were able to have an early morning swim before breakfast. Owner is really nice and helpful. Place is tidy, quiet and next to a lovely small beach, where you can have delicious diner. I like the tea and coffee set placed in the room. Fantastic host! Very comfortable bed! Cozy room Nice terrace for breakfast! Quiet location, extra clean room, spacious & clean bathroom, the most comfortable bed I have ever slept to. Quietly located 100 feet from the beach of Kounoupitsa in Spetses, Arolithos offers elegant rooms with free WiFi and a balcony with views to the sea or the garden. Seafront restaurants and cafes are within a 3-minute walk. Featuring orthopedic matresses, quality bed linen and natural toiletries, all rooms at the Arolithos are decorated in calming tones and have a flat-screen TV. Each has a fridge and coffee machine. A bus to the island's beaches stops nearby. 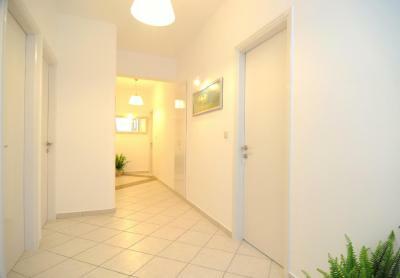 Dapia, the central port is a 10-minute walk away. 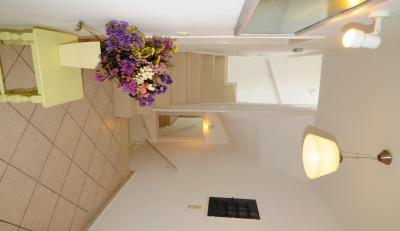 When would you like to stay at Arolithos? Elegant room with balcony offering side sea views, just 98 feet from the beach. 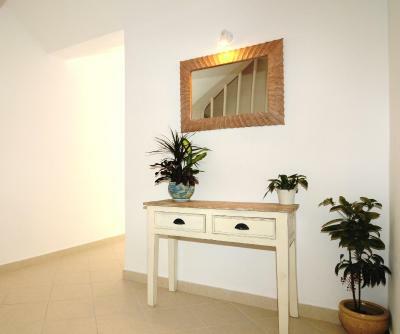 Elegant room with balcony offering garden views, just 98 feet from the beach. A small hotel that offers a luxurious experience. A place where simplicity meets exquisite taste. 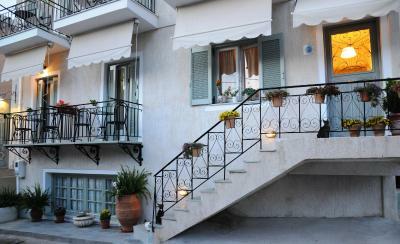 Arolithos offers to its guests high quality accommodation. House Rules Arolithos takes special requests – add in the next step! Arolithos accepts these cards and reserves the right to temporarily hold an amount prior to arrival. Please note that you need to inform Arolithos in advance if you want to use the free of charge baby cot. Please inform Arolithos of your expected arrival time in advance. You can use the Special Requests box when booking, or contact the property directly using the contact details in your confirmation. Two of our party had 'Garden view rooms', but there is no actual garden as such - more of a courtyard and a very attractive white stone wall. In the mornings, instead of a dawn chorus supplied by the local bird population, we were treated to the yelling and screaming from the village mad woman living nearby. We do not have anything we can complain about. Absolutely loved having breakfast served in the room so we could overlook the streets of Spetses and the gorgeous ocean. 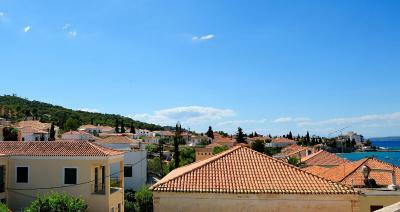 It was perfectly located, clean and really made our overall Spetses experience outstanding! Highly recommended. Room was very modern decorated, especially bathroom was new or newly renovated and generally it was really clean!The bed was comfortable and snacks and fruits in the room are bonus.Bringing breakfast to the room with a nice service is a very smart idea. Excellent location! Comfortable & clean and excellent host. Wish we had more time to stay! Absolute cleanliness, daily change of towels. Lovely breakfast served at the room. Quiet location a short walk from the city centre. A couple of metres away from the beach. Nice restaurants within 10 metres walk. Daily provision of a large bottle of water, cereal bars and coffee. The owner was really kind to even accommodate us with beach towels upon request. Guests are charged extra for milk and yogurt at breakfast. The room was very clean and the breakfast was great. Everything was new and well cared for. Our room still was very small. It was fabulous one of our best holidays. Centrally located and Jenny and the staff were wonderful. Definitely going back!!! Lovely little hotel clean and breakfast was lovely. Thank you for making our holiday so wonderful!!! 😊.